After spending the month of August funding various Earth imaging applications, the Canadian Space Agency (CSA) is preparing to fund three rover projects costing $600K, $300K and $3.2Mln CDN. The Argo J5 Mobility platform being demonstrated at the University of Toronto Institute of Aerospace Studies MarsDome facility on February 20th, 2014. Directly behind the orange J5 is a grey JUNO mobility platform (J1) and a J4 Rover, which is currently the basis of the Artemis Jr., the chassis of choice for the proposed NASA Resolve mission. To the left is a second ARGO J5 rover equipped with ODG’s lunar wheel prototype, optimized for harsh conditions. Both the JUNO and Artemis Jr. Rovers were developed under a series of CSA contracts by New Hamburg based Ontario Drive and Gear (ODG). ODG is considered one of the front runners to receive the next round of Canadian rover funding. Photo c/o author. The ExCore small planetary rover platform (9F052-140062/A) - This is a single $600,000 CDN contract disbursed through the CSA's Exploration Core (ExCore) program for a functional, small, four wheeled planetary rover platform with skid-steering, fully passive suspension, which is manually lockable, and has a basic power system along with a power & mechanical interface to accommodate small exploration surface mobility (ESM) payloads. The tender closes on September 4th, 2014 and the period of the contract will extend from December 1st, 2014 to December 1st, 2015, which likely means that the award will be announced later this year. The lunar polar rover night survival strategy (LPRNSS) concept study (9F052-140125/A) - This is a single $300,000 CDN contract, also disbursed through the CSA's ExCore program, to develop alternative heat sources for a lunar rover, with the intention of protecting the rover from the low temperatures which occur during a lunar night in the lunar polar region. This is one of the biggest challenges at the current state of unmanned lunar exploration, although, as outlined in the February 14th, 2014 Space.com article "Has China's Ailing Moon Rover Survived 2nd Lunar Night," others may have developed a solution. This tender will close on September 18th, 2014, but the period of the contract is undefined and only listed as extending from the "date of issue for a period of six (6) months." The lunar rover drive-train prototype (LRPDP) platform (9F052-140053/A) - This is the big project for Canadian rover manufacturers; a $3.25Mln CDN contract, also disbursed through the CSA's ExCore program, to develop a slightly larger, but still functional lunar rover platform & drive train prototype (LRPDP), able to be subjected to rigorous testing. But you'd best hurry to apply for this; the tender closes on August 29th, 2014 and the period of the contract is listed as being from September 22nd, 2014 to December 18th, 2015. As outlined most recently in the October 20th, 2012 post "Lots and Lots of Rovers Looking for Missions," the last round of funding for the Canadian rover program was part of the 2009 Economic Action Plan, which allocated $110Mln CDN over three years to the CSA for development of the next generation Canadarm (which received $53.1Mln CDN) and for Canadian rovers (which received most of the rest). The CSA funding for the Canadian rovers ran out on March 31st, 2012. It's unlikely that the latest round of rover funding will be enough to fund a completely new rover. So expect the winner of the current tenders to end up being some of the same organizations which ended up being funded in the last funding round. Chuck Hull. Photo c/o Industry Week. Over the the past decade, the building momentum of commercial space initiatives has seen a variety of new players enter the space sector. Often, these new participants are leaders in their fields. Now, 3D printing pioneer 3D Systems is getting into the space business by acquiring two firms with solid track records in that sector. 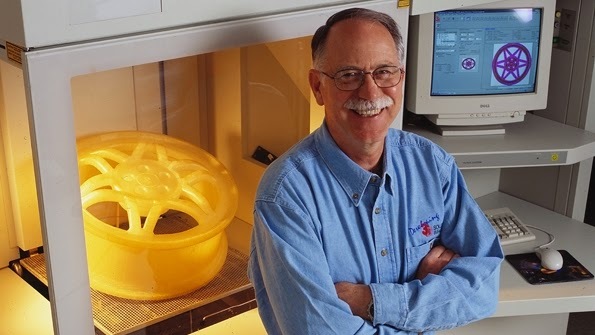 Rock Hill, SC based 3D Systems was founded in 1986 in Valencia, CA, by Chuck Hull, inventor and original patent-holder of the first stereolithography (SLA) based 3D printing system. The companies' industrial 3D printers utilize a variety of technologies including SLA, selective laser sintering (SLS) and fused deposition modelling (FDM). The company also invented the STL file format, now the de facto standard for 3D printers. 3D Systems caters to many industries, including automotive, architectural, dental/healthcare, and aerospace and defence. With $353Mln USD ($384Mln CDN) in revenue in 2012, the firm currently employs over 1000 people in 25 offices worldwide. As stated in the August 13th, 2014 Valuewalk.com article "3D Systems Corporation Buys Sister Companies APP and APM," 3D Systems has been on an aggressive shopping spree over the past four years, acquiring over 45 companies totaling some $520Mln USD ($566Mln CDN). Its newest purchases are two Tulsa, Oklahoma-based sister companies: American Precision Prototyping (APP) and American Precision Machining (APM), both of which have strong aerospace backgrounds. Both APP and APM are providers of rapid prototyping/manufacturing, product development and engineering services to a clientele that includes Boeing, EADS, Cessna, Black & Decker, NASA and General Electric. Both companies have over 24 years of experience in these areas. The cost and details of the dual acquisitions have not been made public. 3D Systems' acquisition of APP and APM will allow the company to expand its presence in a niche where it had previously been small. 3D Systems will now be positioned to offer 3D prototyping and additive manufacturing services to not only large established entities like Boeing and NASA, but also newer space players like SpaceX, Bigelow Aerospace, and Orbital Sciences Corporation. 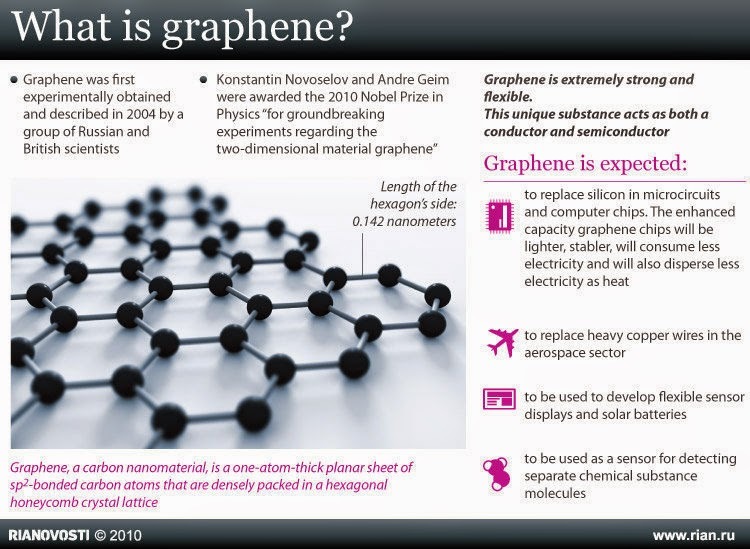 3D Systems' recent moves parallel those of another technology giant: Google. Back in June, Google bought Skybox Imaging, an Earth-observation satellite builder and data provider, for $500Mln USD ($544Mln CDN) in cash. In April, the company purchased Titan Aerospace, a maker of solar-powered drones. As well, in December 2013, Google turned many heads with its purchase of DARPA-affiliated robotics firm Boston Dynamics. These purchases are part of Google's long-term goal of becoming a provider of internet access (via satellites & drones) as well as services. Most significantly, space lies at the core of Google's plans for growth. 3D Systems' and Google's acquisition strategies share two key commonalities: the acquisitions' products enhance their own (i.e 3D Systems' aerospace presence and Google's Maps and Earth software) and they provide an entry point into expanding new markets (i.e nano/micro-satellites, space-related services like Earth imagery and Internet access for the developed/developing world). In entering the space business, these two tech titans seek to bring the Silicon Valley mindset to a long-static industry. Hadfield in Emirates, Russia in Lather & UrtheCast in Orbit! It's been a busy week for the Canadian space industry with a retired astronaut sourcing out middle east space contracts, Russia threatening additional economic sanctions to "keep the country's space and rocket industry afloat" and Earth imaging company UrtheCast finally offering up Earth images of our home and native land. Chris Hadfield's recent trip to the United Arab Emirates (UAE) hasn't driven much notice in Canada, but it seems to have made him a household name in the tiny, but affluent, Persian gulf state. The government owned English language daily newspaper, the National, seems to have taken a particular interest in the stalwart Canuck, with stories like the July 22nd, 2014 article "Canadian astronaut offers to help UAE’s space aspirations" and the July 23rd, 2014 article "Canadian astronaut describes life in space" being offered up to an approving readership. As outlined in the July 27th, 2014 National article, "UAE’s space programme could inspire innovation," Hadfield, space advocate Robert Zubrin and quite a number of others have made recent visits to the UAE in an effort to access the 20Bln AED ($5.95Bln CDN) which the UAE has announced is available as part of its plans to build a national space agency and send an unmanned mission to Mars by 2021. 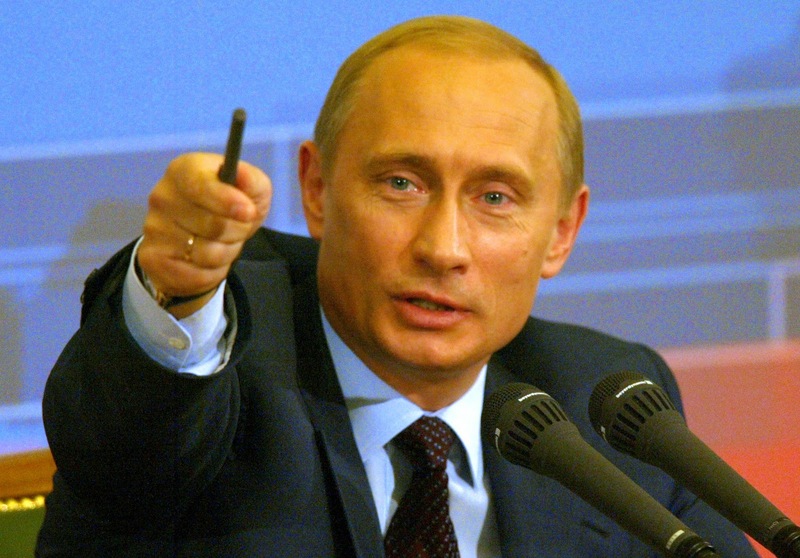 Russian president Putin pointing. Photo c/o Wikipedia. Of course, some national governments aren't quite so pleased with recent Canadian activities and among these would be the Russian government under president Vladimir Putin, which last week banned food imports from nations which had previously instituted sanctions over Russian activities in the Ukraine. As outlined in the August 7th, 2014 CBC news article, "Russia sanctions show Putin's 'short-sighted desperation,' Canada says," the fast expanding trade war now includes meat, fish, milk, fruit and vegetables from Canada, the US and the European Union. Even worse for the Canadian space industry, as outlined in the August 7th, 2014 RIA Novosti article "Russia to Draft Import Substitution Program for Space Industry," the Russian government is crafting an "import substitution plan" to find domestic replacements for technology imports expected to be lost by Russia as a result of trade sanctions. Of course, there is no current word on how this new plan would affect possible Canadian aerospace activities in Russia although, as outlined in the July 31st, 2014 Space News article "MDA Satellite Exports Feeling the Effects of Canada’s Tough Stance on Russia," Canadian firms are already being affected by sanctions. As covered in the April 28th, 2014 post "M3Msat and the Politics of Dancing in the Crimea," the Canadian government decided "not to proceed" with the planned June 2014 launch of a Canadian micro-sat, from the Baikonur Cosmodrome in Kazakhstan, in protest over Russian actions in the Ukraine. On the other hand, sometimes everything works out as it should. 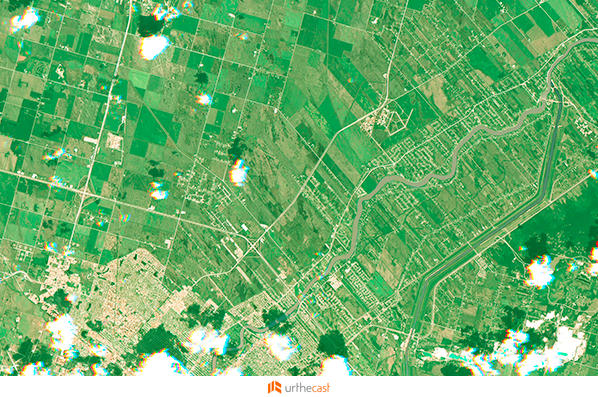 As outlined in the August 7th, 2014 Techvibes article, "UrtheCast Releases First Images of Canada from Space," the company has finally begun to release promotional images taken from the UrtheCast cameras on board the International Space Station (ISS). Although beset by challenges, the firm has earned recognition at the BC Technology Impact Awards as the "most promising pre-commercial technology" and last year was named one of the country's hottest innovative companies by the Canadian Innovation Exchange (CIX). Winnipeg, as seen from the ISS. Photo c/o UrtheCast. Minister Moore on Thursday. Photo c/o CBC. Spending almost $7Mln CDN to develop a series of applications ("apps") for satellite derived data seems a little expensive in a country chock full of software developers offering up their services for free at events like the annual International Space Apps Challenge. 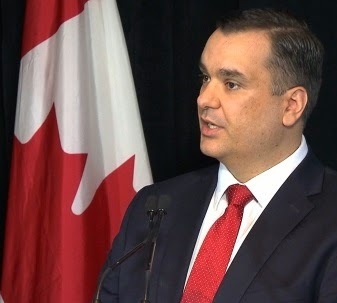 Of course, that's not the impression intended to be conveyed by the August 7th, 2014 Industry Canada press release, "Industry Minister Moore announces support for new space technologies that will provide crucial information about the Earth." The announcement that the Canadian Space Agency (CSA) would be awarding contracts worth a total of $6.7Mln CDN to develop new applications for satellite derived Earth imaging data was intended to bolster Canadian claims of competitiveness in the fast growing but crowded commercial marketplace. 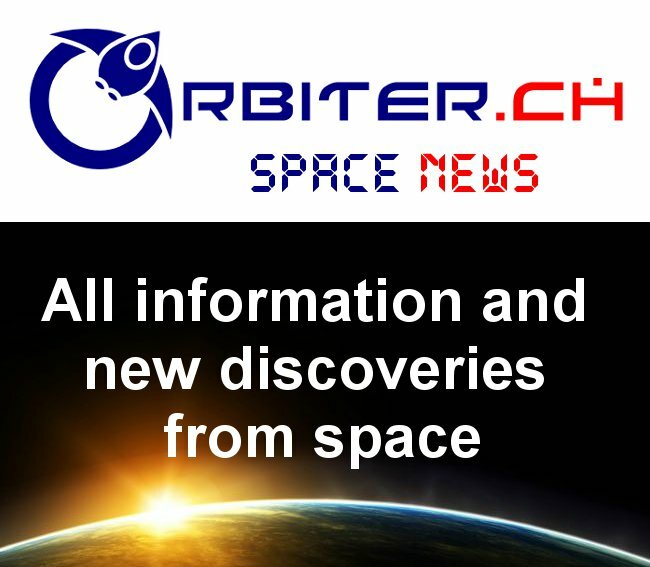 But while space has always been difficult to get to and operate in, the development of applications intended to utilize the data collected from space has always followed pretty much the same processes and methodologies as any other software development project. This is why NASA, Google, Yahoo, HP, the World Bank and others banded together to create the International Space Apps Challenge in 2012. 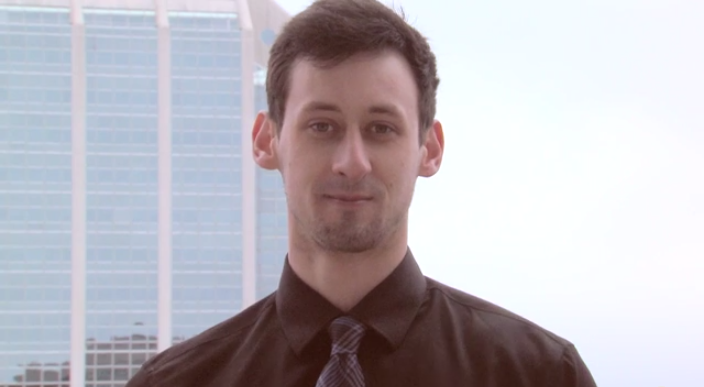 As outlined in the May 19th, 2014 post "CDN "SkyWatch" wins "Best Use of Data" at Int'l Space Apps Challenge," a Canadian team even won the 2014 Challenge by designing and building (over a single weekend) an application which takes worldwide observatory data and combines it in an easy to understand, twitter-like set up to plot the data on on Google Sky. Of course, in the absence of any real innovation and as outlined in the August 7th, 2014 Government of Canada list of organizations scheduled to receive a contract, the CSA funding will be provided to 3vGeomatics, AECOM, Array Systems Computing, ASL Environmental Sciences, C-CORE, Effigis Géo-Solutions, GHGSat, the Institut national de la recherche scientifique (INRS), Kepler Space Inc., MacDonald Dettwiler (MDA) and PCI Geomatics as per the standard CSA operating procedures. 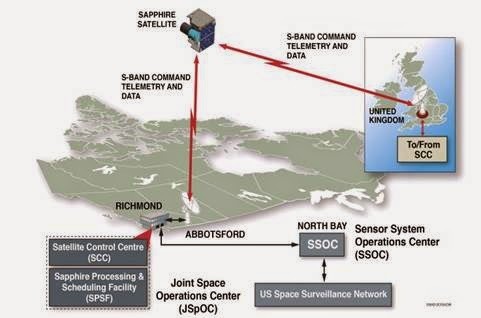 The individual awards are each around $500,000 CDN and most of the applications being developed will use commercially available RADARSAT 2 derived synthetic aperture radar (SAR) data. But will the CSA awards preserve Canadian competitiveness in the growing Earth imaging applications industry? generate pulses used to gather surface information. This investment will support local high-technology jobs and economic growth while the resulting information could help Canada more efficiently manage water resources, prepare for potential flooding, and help avoid costly damage from flooding or drought. The Surface Water and Ocean Topography (SWOT) mission will survey 90 percent of the globe, studying the Earth's lakes, rivers, reservoirs and oceans. SWOT data could lead to improvements in many water-related services in Canada, including operations at sea and water management systems, and will provide measurements for lakes and rivers in Northern Canada for which none currently exist. 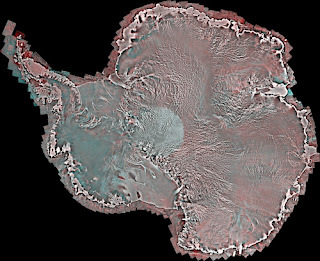 has unveiled a new satellite image of Antarctica, and the imagery will help scientists all over the world gain new insight into the effects of climate change. Only time will tell if the open source development model has staying power, but this looks like a good start. Canada can create useful instruments to place in space with funding from the Federal government while the data derived from those programs is provided for free to the public which paid for the data.